Cinder cones can develop very quickly. They typically end their lives with an outpouring of black basalt lava that flows across the landscape. Kelbaker Road passes through one of the youngest lava flows. 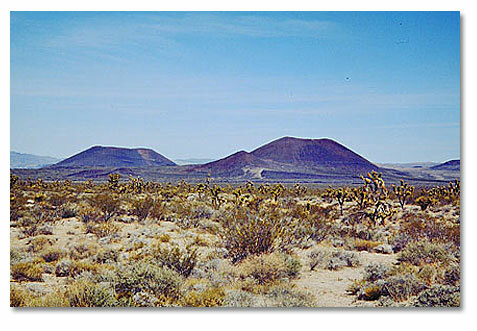 Probably the best example of recent volcanic activity (8,000-10,000 years ago) in the Mojave Desert is an area which contains more then 30 young volcanic cones clustered together on the surface of a series of older lava flows. Ailken's Mine Road provides an interesting side trip through the heart of this region. Click here for a video on the area. Exploring Route 66 - Historic Mohave Desert Sites Amboy Road at Sheeps Hole Pass looks into the big basin of Bristol Dry Lake, which was covered by the sea about four million years ago. Across the salt lake, Amboy Dry Crater rises in the distance. 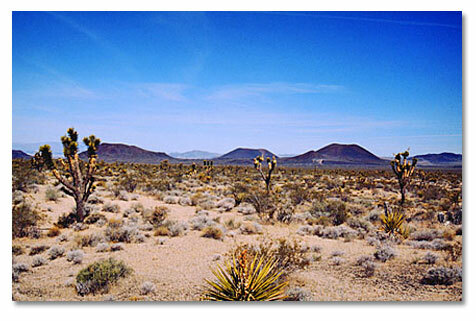 The town of Amboy dates back to 1858; it became a critical gas and rest stop on Route 66 after World War II. When I-40 bypassed it in 1972, Amboy almost became a ghost town. Follow the DesertUSA team as they revisit old Route 66 in the Mohave and take a look at some historic sites along the way.